The symptoms may vary from chronic diarrhea, chronic constipation, acid reflux, irritable bowel syndrome (IBS), Crohn’s disease, or an inflammation in the gut among others. The severity of the disorder may indicate the severity of autism. The cause of the problem can be either behavioral or biological. 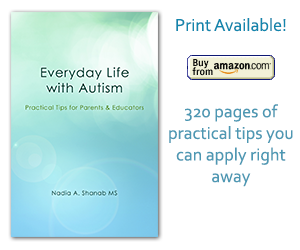 One of the autism main traits is rigidity and the love for routine. Which explains why some kids with autism eat only a limited number of foods. A strict diet may cause lack in certain nutrients, supplements, vitamins, fibers, and so on, which leads to a GI problem. In this case the behavioral disorder should be addressed by seeing a specialized nutritionist or a behaviorist. Another trait of autism is having sensory integration issues. The taste, texture, smell, aspect, or color of certain foods may offend your child’s senses, so your child would stop eating these foods. In other cases the GI problem arises from food allergies or food intolerance. A pediatrician can guide you to figure out the exact source of the problem. Whether the reason is behavioral or biological, children suffer and often times have communication problem telling what bothers them, especially non-verbal kids or with poor speech. They start acting up and become restless and can be aggressive or even throw a temper tantrum. But luckily the symptoms manifest the disorder. One of the simplest things parents can do while waiting for a professional advice, is to try the gluten-free and casein-free diet, it won’t hurt. Besides, there is a variety of foods now available for this purpose. Many parents approve the effectiveness of this diet. Another simple choice is trying probiotics. Probiotics are live bacteria that are good for health especially the digestive system. They are found in some foods like yogurt. If your budget allows opt for organic food. Pesticides and chemicals may contribute to the problem. Don’t wait too long before seeing a health provider. Catch the problem early enough and don’t let bad habits establish. In this post I am not giving any medical/professional advice or recommendation. I am trying to point out the importance of seeking help from professionals/health providers if you notice that your child with autism shows signs of digestion troubles. The solution can sometimes be very easy to solve. It is also very important to mention that not all children with GI problems have to be on the autism spectrum.